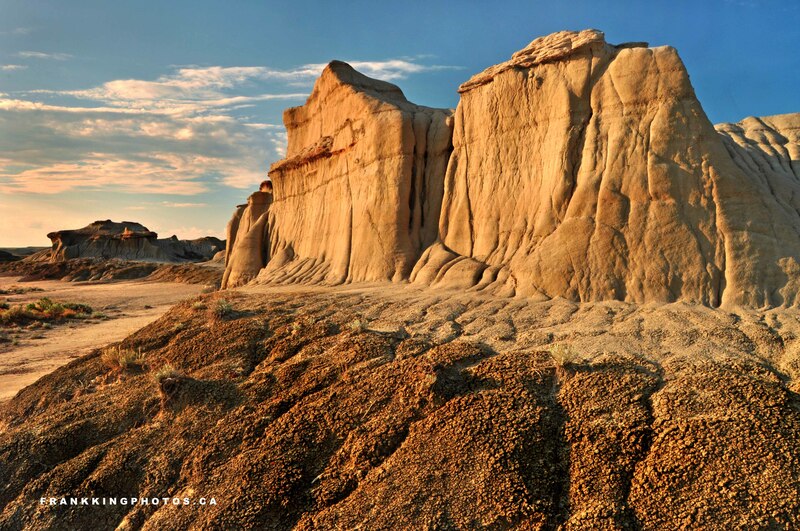 Definitely one of the most amazing places I’ve ever made photographs, Dinosaur Provincial Park is a is a UNESCO World Heritage Site about two and a half hours drive southeast of my home in Calgary. It’s one of the richest dinosaur fossil areas on the planet. Forty species have been discovered at the park and more than 500 specimens have been removed and exhibited in museums across the globe. This is definitely an area best seen at sunrise and sunset, especially in summer, when midday heat makes hiking a tiring experience. Midday light also bleaches the colours; sunrise and sunset help create the glorious hues you see here. Nikon D90, tripod, polarizing filter, enhancing filter. Thanks for stopping by and reading my articles! God bless you! Thank you…yes, I have lot’s of posts, I enjoy writing. You might be interested in the ones in the menu choice, “Blurbs from my upcoming trilogy.” One of them has a powerful and moving excerpt where the main characters in book two have a spiritual experience where they witness Jesus’ execution. It radiates the suffering He went through, as well as His great, unfathomable love for us… this one is in my post titled, “The Crown of Thorns-are you wearing yours?” If you stop by and read it, please let me know what you think. Thanks again, and blessings to you!